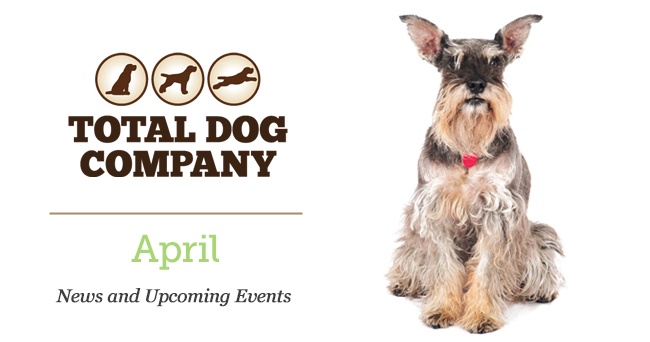 We’ll let you know in our mid-April email about flea and tick options. Please give us input on what’s important to you in that regard. Raw Bistro Pet Fare frozen raw food 4-lb. packages are being discontinued to make room for new 3-lb and 6-lb packages. The remaining 4-pounders are $3 off. As an introductory bonus to the new larger size patties of Raw Bistro, get a 4-piece package of Raw Bistro Split Knuckle Bones free with purchase of a 6-lb. entrée. 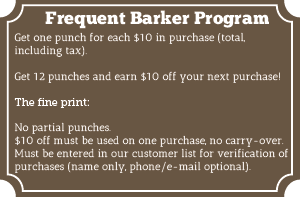 Still time to trade in your “grocery store” brand dog food for a discount on American Natural Premium brand. $3 off a small bag, $10 off a medium or large bag, by presenting what’s left of a bag of food that doesn’t pass our entrance exam (even if it’s an empty bag). 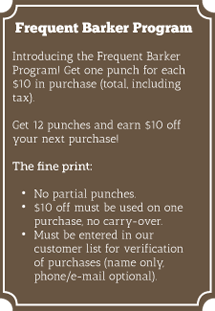 Get a bonus punch on your Frequent Barker Card by leaving a review of Total Dog Company on our Google+ page. Raw Bistro Pet Fare in 6-lb. bags of large (½ -lb.) patties. An additional Raw Bistro formula: Bison. Available in 3-lb mini-patties and 6-lb. big patties. Potty Time Chimes: teach your dog to “ring the doorbell” to go out. Comes with DVD. American Natural Premium Coconut Colada treats. Crunchy and smell so good, YOU’LL want to eat them! Solvit brand travel bag. Comes with two collapsible dishes, a water bottle, and a food tote. Various zippered and mesh compartments.